When we started, we didn’t necessarily have vast goals of “transforming education” or “solving world hunger”. We just wanted to do something…something that mattered. In Fall of 2008 we ran our first Boot Camp for 6 students. They were nervous. We were terrified. The results came in and the students’ scores spoke volumes! Today, TorchPrep is working arm and arm with a myriad of schools and thousands of families, with the goal of helping position these kids for college. We are a band of visionaries, artists, teachers, hackers, poets, advocates, and friends. Our movement is about changing the lives of students. We work with families, schools, universities, non-profits, for profits, cities, and anyone else who cares to see this emerging generation well positioned for life. We make our mark on this world by training students to maximize their score on the ACT test. Whiteboard + Coffee (lots of it) + 2 Discontent Dreamers = TorchPrep. Dream Big. Plan Well. We equip our trainers to understand that higher ACT test scores are our by-product, not our focus. Our focus is building a culture and an experience that fits the paradigm of a teenager, compelling them to care. As a result of our rapport, relationships, energy, and high expectations, the ACT test scores have soared. Build with the student in mind and you’ll create change. The future is bright. Through our trainings, we are hoping to leave a legacy that makes students, schools, and cities better. We love what we do and have every intention to keep the awesomeness flowing at full force! We start with the facts. Standardized tests do not exactly pull on the heartstrings of the average 16 year old. Standardized tests do have a fundamental impact on a student’s future. This reality demands that we come at this problem with exuberant amounts of charisma and strategy. Our vision is to train students to think differently…to think strategically. The following image represents our “how”. Each circle is a governing ideology, and everything our company does is interpreted through the following lens. Instruct: Deliver content/information in a clear, concise fashion that the listener can comprehend and build upon. Sound instruction is paramount for our success and it is a hill we die on. 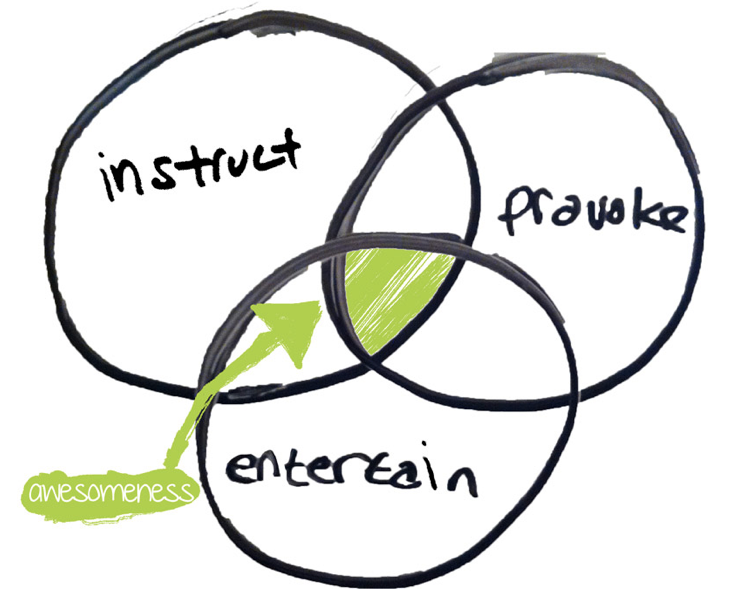 Entertain: We bring large amounts of energy, stories, and interpersonal skills to the table. Our zeal is enough to carry students through the entire Boot Camp. Provoke: Push students to develop an innovative, creative, and strategic approach to both education and life as a whole.